Washington, DC (March 22, 2018) – Today legal publisher Fastcase announced the addition of a library of world-class employment law practice materials to its portfolio. In conjunction with Littler Mendelson, the largest global employment and labor law firm, Fastcase is now offering 79 titles from the Littler Employer Library within the Fastcase legal research platform. 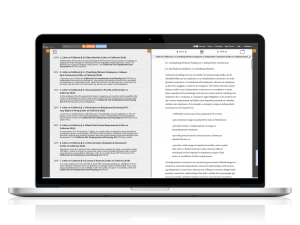 “The chance to add the Littler Employment titles to Fastcase provides our subscribers with fantastic federal and state content relevant to all of the states where our subscribers practice. We could not be more excited about adding this authored expertise,” said Steve Errick, Fastcase Chief Operating Officer. Fastcase continues to add must-have content for its subscribers and provide leading legal analysis with contributions from firm partners across the country. With the addition of Littler’s library of employment law publications, the Wolters Kluwer Treatise Library, expert blogs from LexBlog, and the recently debuted imprint, Full Court Press featuring RAIL: The Journal of Robotics, Artificial Intelligence & Law, the expert author publications available within Fastcase are quickly emerging as an invaluable resource for attorneys.